After writing few bits mostly about the big cities it is time to go back to what is the best about America, its rural heartlands. My latest adventure started in Atlanta but I left it as soon as I had landed and headed north towards Tennessee as I wanted to explore some positively rural corners of the south. After quite a pleasant drive (including an overnight stop in the fantastically named Chattanooga) I got to the first place I planned to visit during this trip, the town of Lynchburg. This small city, located in the rural heart of Tennessee, is home to one of the best known brands in the world, the legendary Jack Daniels. Of course the J.D. distillery (located just east of town) had to be my first port of call. I’m the sort of guy who likes visiting mines, factories and all sorts of strange industrial places, but this distillery is a great place for anyone to visit. The free tour offers the chance to visit a real working distillery, a place where every single drop of J.D. comes from. Unlike some other well known brands (for example Guinness, which is nowadays brewed in many countries), Jack Daniels whiskey still comes only from Lynchburg. Our well-spoken and entertaining guide took us to all the important parts of the distillery. Stops included: the fermenting vats (where we could even dip our fingers and taste the contents), the building where the whiskey is filtered through charcoal, the bottling plant and the barrel storehouse. We also visited the spring where all the iron-free water comes from as well as the house once used by Jack himself. But probably the most unusual stop was part of the factory where the maple charcoal is made. To start the wood fires burning workers use extra strong whiskey as an accelerant (so not to contaminate the wood) and they will let you taste a bit of it. Damn, it burns. I strongly recommend this tour to anyone being within a 1000 mile radius of Lynchburg. It is well worth the effort of getting there. The city of Lynchburg itself is also worth stopping in. Its population is about 5000 and it has only one traffic light (rather unnecessary judging by the traffic when I was there), but it is full of southern charm. The heart of it is a lovely town square dominated by the Moore County Courthouse. 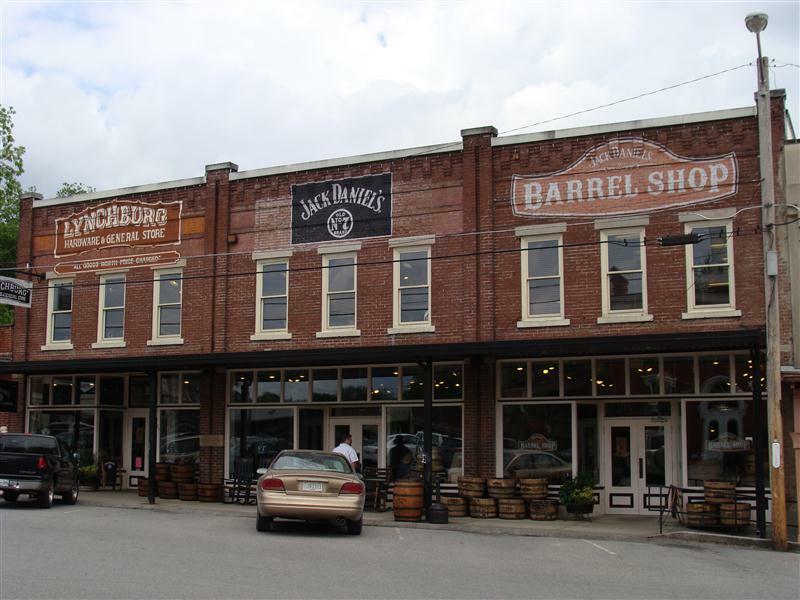 The square is lined with local businesses offering all sorts of things connected to Jack Daniels, from key rings to cooking sauces and from T-shirts to furniture made from the old barrels. And somehow it doesn’t really feel too commercial or kitschy. I really had a great day in Lynchburg. Oh, by the way, Lynchburg is located in, so-called, dry county which prohibits the sale of alcohol, so you won’t be able to buy the famous whiskey itself. The only exception is the distillery itself which has a special waiver to sell collector edition bottles there. Next stop, Nashville. On the first look of it, it is just another mid-sized city in the middle of the country. But don’t be fooled. It might be an average city during the daytime but once it gets dark, it is a great place to experience some of the best night life in America. To put it simply, Nashville is the capital of the country music industry. Everyone who is someone in this business, as well as anyone hoping to be someone, heads there. 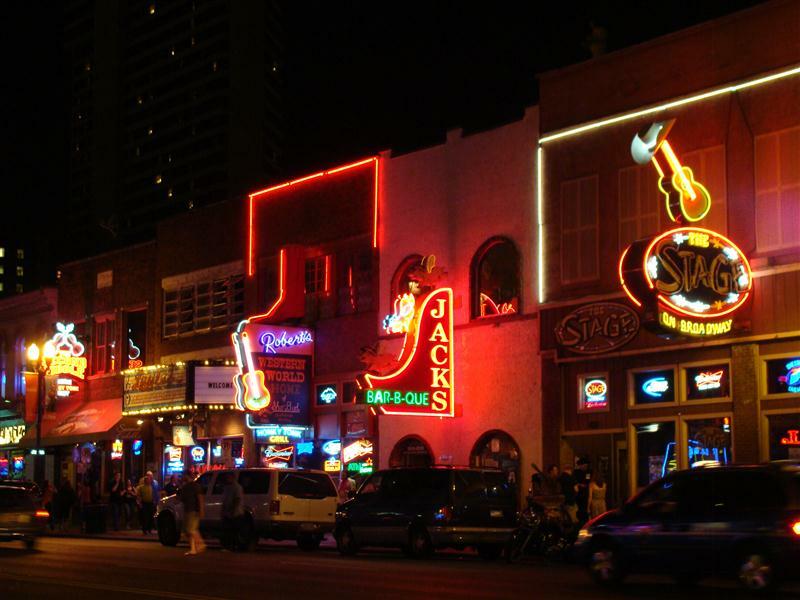 Of course it helps if you like country music even just a bit, but to be honest the bars and saloons of Nashville offer great fun for everyone. Most of them are conveniently located along the short stretch of Lower Broadway which means you can visit many of them during the night. It was a mid-week evening when I got there, but all the joints were open late. And I really mean late (especially if you are used to the ridiculously early closing hours of British pubs). By the time I headed back to the hotel, around 3am, none of the bars were closing and most of them still had live music on. There are plenty of talented and hopeful young aspiring musicians in Nashville and they all want to impress, regardless of the time of night, which means that Lower Broadway is buzzing and lively well into the wee hours. It is also a great sight with many colourful neon signs advertising bars with names like “Tequila Cowboy”, “Wild Beaver Saloon” or “The Full Moon Saloon”. I definitely had a great time in Nashville. After Nashville, battling a slight hangover, I headed towards another great southern state, Kentucky, home of bourbon, tobacco and horse racing. But as I don’t smoke and don’t give a damn about the horse racing I headed straight for some of the excellent bourbon distilleries. They are mostly located in small towns or even villages and getting there gives you the opportunity to explore some fantastic rural drives. First, a few words about bourbon itself. It is a type of American whiskey; the name comes from an area known as Old Bourbon, (which, in turn, was named after the French royal family), around what is now Bourbon county, Kentucky. In the past the whiskey was transported in barrels with the name of the county on them and people started calling it simply bourbon. For a whiskey to qualify as bourbon, the law stipulates that it must be made in the USA. It must be made from at least 51% and no more than 79% Indian corn, and aged for at least two years (most bourbon is aged for four years or more). The barrels for ageing can be made of any kind of new oak, and are charred on the inside. One of the best distilleries I visited was Maker’s Mark which is located in the tiny city of Loretto (pop. less than 1000). You will need a good map (or a Sat-Nav) to get there, as you have to navigate some small rural lanes on your way, but it is well worth the effort. They offer a great tour of their relatively small but really interesting distillery. Maker’s Mark itself doesn’t have a too long a history as it was started only in the 1950s, but it utilises a much older distillery complex. Its distinctive listed buildings are painted black with elements of red and are located on neatly landscaped grounds. It looks more like a campus of some well to do university than a factory. The tour itself was as good, if not better than the one of Jack Daniels. We followed our funny and entertaining guide to all the corners of the distillery and it was possible (even encouraged) to take pictures absolutely everywhere. Maker’s Mark is a rather small operation and they are proud of that. Every single bottle is, for example, hand dipped into its trademark red wax. If Maker’s Mark distillery looks like a campus, then Buffalo Trace looks like a proper factory. Its lovely historic red brick buildings are located on the outskirts of the Kentucky capital, Frankfort, and are much easier to find than many other distilleries. 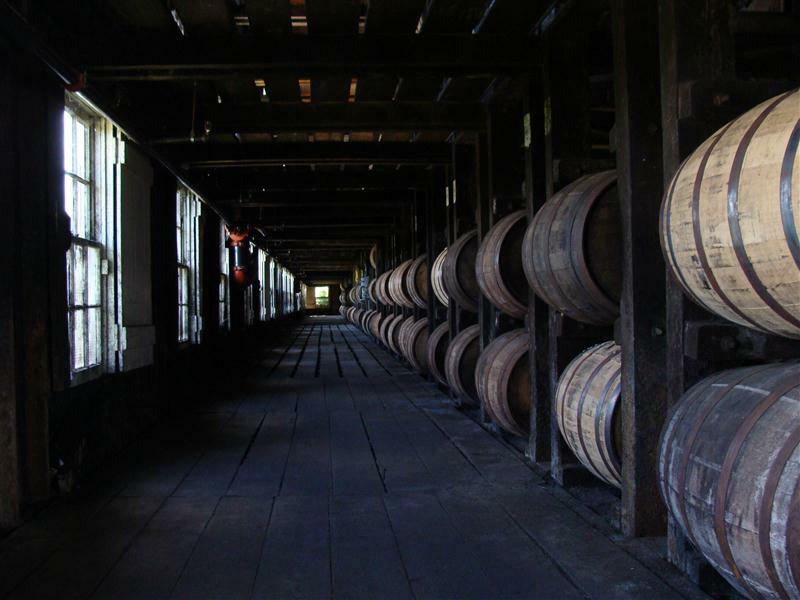 According to some sources, Buffalo Trace is the oldest continuously operating distillery in America. During Prohibition the distillery was even permitted to remain operational, to make whiskey for “medicinal purposes”. The tour they offer might not be as good as some of the others as they don’t take people to the distilling parts of their factory, but I really enjoyed my visit there. I guess it is because I prefer the old rugged industrial look of it over the gentrified look of some of the smaller boutique operations or the clinical industrial coldness of some big modern distilleries. One of those big boys is Wild Turkey. Located in Lawrenceburg it is one of the biggest distilleries in the world. It is a huge industrial operation and touring it offers a different perspective of the industry to the smaller historic distilleries. There are a lot of stainless steel pipes and computer screens but far less charm. Fortunately its barrel warehouses are as old school as at any other distillery. During the tour you might have a chance of meeting Jimmy Russell the master distiller. He often drives his red pick-up truck to inspect the barrel storehouses. If you are lucky you can even chat to Jimmy – he is a walking institution. He started working here in 1954 and before that his father and grandfather both worked for the distilling business. Bourbon must be flowing in his veins. The last distillery I visited was Woodford Reserve. Located in Woodford county, eight miles from the town of Versailles, it is probably the most difficult to find of all the bourbon sites I visited. Distilling on the site began in 1797 and the distillery building itself was erected in 1838, making it the oldest of the nine bourbon distilleries in current operation in Kentucky – although the site has not been continuously operational as a distillery for that entire period. It is also the smallest bourbon distillery to produce a definitely premium brand. The stone buildings are immaculately renovated and somehow feel more like a museum than a factory. But there is no way of denying that it is a great place, especially on a warm spring day when, after the tour, you can relax on the lovely porch of its reception building. One word of warning. All the distilleries offer free tasting after the tours. The tasting samples are small but remember that you will have to drive back. Don’t drink too many of them, regardless of how delicious they are. Bourbon chocolates might be a safer option. In general, Tennessee and Kentucky are great states to visit. They both have a clearly southern feel, which might pus some people off (especially Europeans), but it shouldn’t be the case as they are full of easy going and friendly people. Come on, let’s face it, people who make some of the best alcohol, grow some of the best tobacco and bet on horses must know a bit or two about how to have a great time. Spring in the south is an especially good season to drive the rural highways connecting the distilleries while listening to some of the local country radio stations, or to sit on a porch sipping great bourbon while warming up your old bones, or to simply have a fun night in Nashville. Or how about having a great BBQ followed by the bourbon chocolates? I have spend some of the most relaxing days during all my American travels there. This entry was posted in Uncategorized and tagged bourbon, Buffalo Trace, distillery, Jack Daniels, Kentucky, Lynchburg, Maker's Mark, Nashville, Tennessee, whiskey, Wild Turkey, Woodford Reserve on August 16, 2012 by admin.